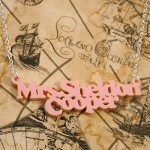 It never ceases to amaze me how much there is out there for crafty geeks online! 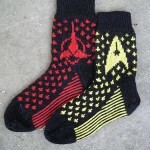 There are endless projects out there on the web to browse through, but here is my round up on the best geeky sock patterns. 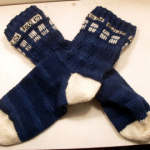 Michelle has already covered the free TARDIS socks knitting pattern for us (and there’s another good TARDIS knitting pattern on Ravelry here). But there are plenty more where that came from. 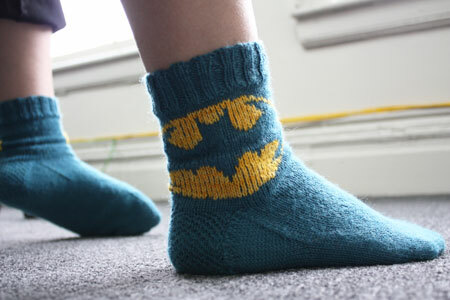 This is a blog post by knitter and Batman fanatic Jess for the Lion Brand Yarn blog where she shares with you how she designed and made a pair of Batman socks. She will help you out gladly if you have any problems. Ok, it’s time to face it. 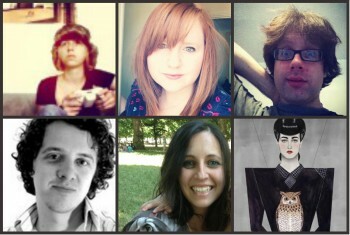 We can’t all be Gryffindor students, and nobody wants to be a Hufflepuff; some of us would just have to be Slytherins! But there is a bright side! These socks, for which the pattern has been donated to the fundraising website P-Hop, would be ideal for you and help you feel cosy and at home in the Slytherin common room. 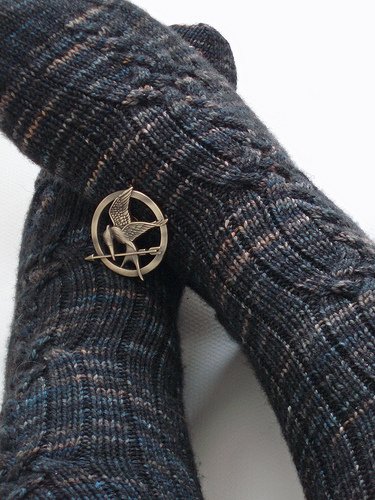 And if you don’t mind paying £4 for a pattern, these Ravenclaw Pride socks by Ann Kingstone are pretty special (she’s also created patterns for the other houses that are equally great). 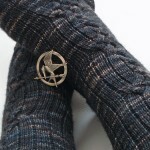 These socks, inspired by The Hunger Games character Katniss are the first of a trilogy in tribute to the books. 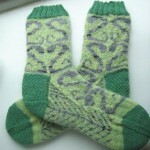 They’re from the free Paraphernalia pattern on Ravelry by Taina Anttila. Keep an eye on the Haramis Knits blog for more patterns and designs to come. 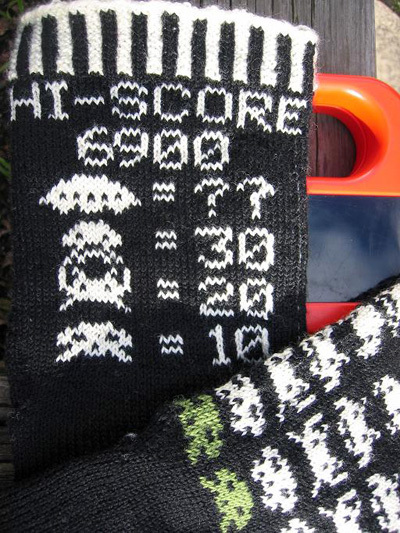 These retro feel socks are great for gamers. 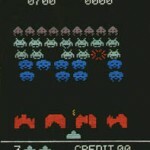 The free pattern by Aija Goto on Knitty features the little aliens, a Hi-Score chart and of course your little space ship. 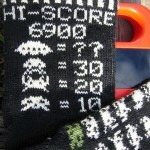 Emma wrote about these Space Invader socks a while back along with a pattern for a Space Invaders hat. 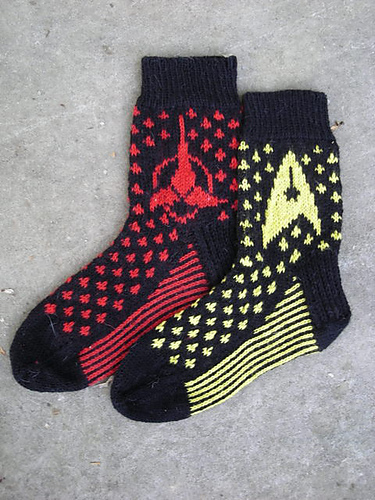 Star Trek fan Laura Hohman created this pattern and shared it for free on Ravelry after teaching knitting at a Sci-Fi convention. Have a look at some of the completed projects on Ravelry for some great inspiration on different colourways and modifications. 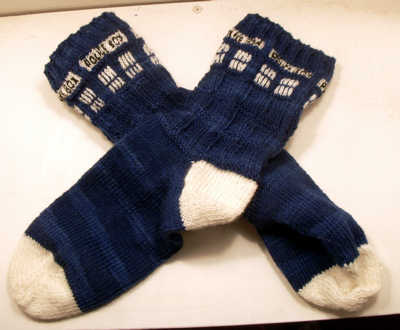 Have you found any geeky sock patterns that you would like to share with us? Or have you had a go at knitting any of the ones that I have shared with you today? Let us know in the comments below!